The ability of the patient for regular follow-up visits. Fluorescein angiography (FFA) evidence of macular ischemia of moderate-to-severe degree. Moderate irregularities are defined as abnormally dilated and tortuous capillaries budding into the foveal avascular zone (FAZ), terminal arterioles/venules directly abutting FAZ margins, and enlarged intercapillary spaces around the FAZ. Ischemia was diagnosed only when the longest diameter of FAZ was >1000 μ. Severe FAZ irregularity is defined as the destruction of the FAZ architecture: grossly enlarged FAZ with “pruned off” arterioles. Thirty eyes of thirty patients with DME were enrolled in this study. The demographic and clinical characteristics of all patients are summarized in [Table 1]. There were no significant differences at baseline between the two groups, including demographic characteristics and baseline CMT and BCVA values as demonstrated in [Table 2]. At month 6, the mean change of BCVA in VMA + group was 10.21 ± 6.33 letters, whereas the mean change of BCVA in VMA− group was 6.68 ± 6.35 letters. Both groups showed statistically significant improvement in BCVA from baseline (P < 0.05). The difference between the improvements in the two groups was statistically significant (P = 0.007) [Table 3]. 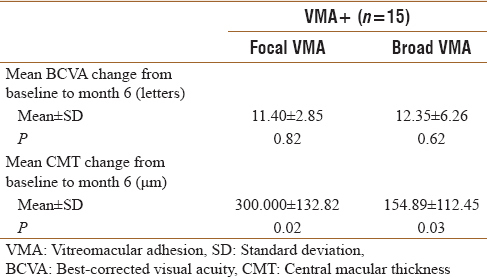 At month 6, the mean change of central retinal thickness (CRT) in VMA+ group was 151.46 ± 121.47 μm, whereas the mean change of CRT in VMA− group was 139.33 ± 144.23 μm. 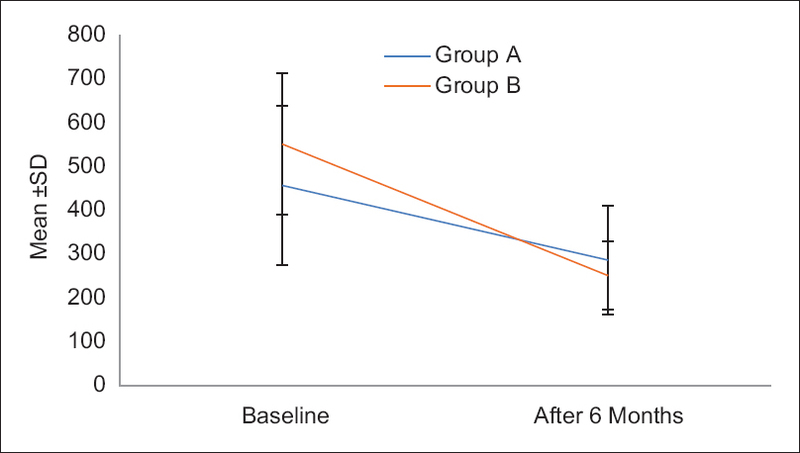 Both groups showed a statistically significant reduction in CRT from baseline (P < 0.05). The difference in the mean reduction of CRT in the two groups was not statistically significant (P = 0.662) [Table 4] and [Figure 1]. 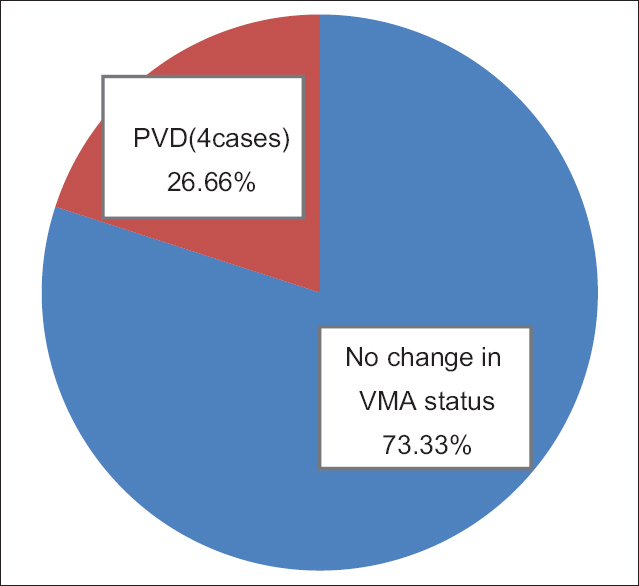 Analysis of the SD-OCT images of the 15 VMA+ patients showed that PVD occurred in 4 eyes, whereas 11 eyes had no change in VMA status by the 6th month visit. 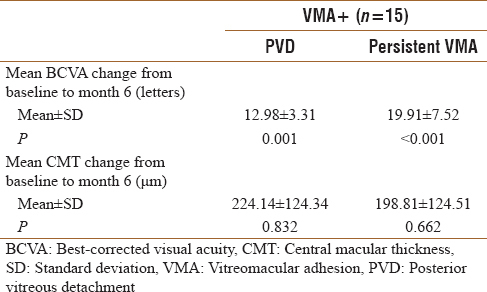 The mean change in BCVA in the eyes in which PVD developed from baseline to month 6 was 12.98 ± 3.31 letters compared with 9.91 ± 7.52 letters in the eyes that had persistent VMA at month 6 (P = 0.181). Similarly, the mean change in CRT was 224.14 ± 124.34 μm in the 7 eyes in which PVD developed compared with the mean change in CRT was198.81 ± 124.51 μm in the 11 eyes that had persistent VMA at month 6 (P = 0.183). Of the four patients in which PVD developed, two patients demonstrated PVD after the first injection, one patient demonstrated PVD after five injections, and one patient demonstrated PVD after six injections. Rates of development of PVD were significant between the two groups (P = 0.001) [Figure 2] and [Table 5]. Of the 15 patients with VMA at baseline, 3 eyes had focal VMA and 12 eyes had broad VMA. Mean change in BCVA from baseline to month 6 was 11.40 ± 2.85 and 12.23 ± 6.26 letters in eyes with focal and broad VMA, respectively (P = 0.82). Mean change in CMT from baseline to month 6 was 300.00 ± 132.81 and 154.89 ± 112.45 mm in eyes with focal and broad VMA, respectively (P = 0.02). Two of the 3 eyes that had focal VMA at baseline demonstrated PVD, whereas 2 of the 12 eyes that had broad VMA at baseline demonstrated PVD [Table 6] and [Figure 3]. Agarwal A, Sarwar S, Sepah YJ, Nguyen QD. What have we learnt about the management of diabetic macular edema in the antivascular endothelial growth factor and corticosteroid era? Curr Opin Ophthalmol 2015;26:177-83. Giuliari GP, Guel DA, Gonzalez VH. Pegaptanib sodium for the treatment of proliferative diabetic retinopathy and diabetic macular edema. Curr Diabetes Rev 2009;5:33-8. Diabetic Retinopathy Clinical Research Network; Wells JA, Glassman AR, Ayala AR, Jampol LM, Aiello LP, et al. Aflibercept, bevacizumab, or ranibizumab for diabetic macular edema. N Engl J Med 2015;372:1193-203. Chang CK, Cheng CK, Bai CH. 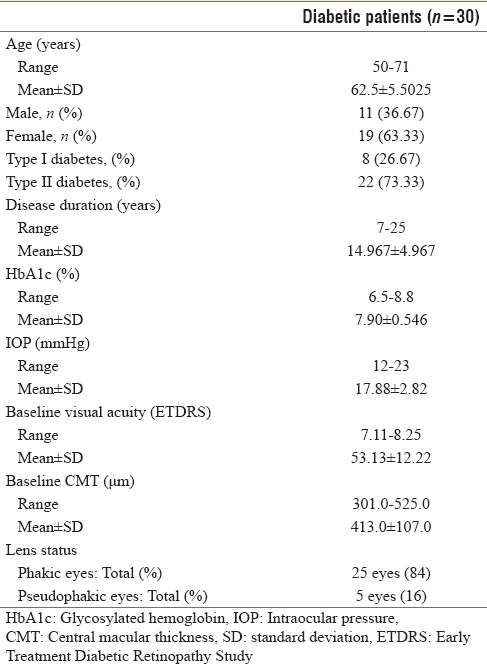 Development of vitreomacular interface abnormality in patients with diabetic macular edema. Taiwan J Ophthalmol 2012;2:93-8. Papadopoulos N, Martin J, Ruan Q, Rafique A, Rosconi MP, Shi E, et al. Binding and neutralization of vascular endothelial growth factor (VEGF) and related ligands by VEGF trap, ranibizumab and bevacizumab. Angiogenesis 2012;15:171-85. Musat O, Cernat C, Labib M, Gheorghe A, Toma O, Zamfir M, et al. Diabetic macular edema. Rom J Ophthalmol 2015;59:133-6. Nasrallah FP, Jalkh AE, Van Coppenolle F, Kado M, Trempe CL, McMeel JW, et al. The role of the vitreous in diabetic macular edema. Ophthalmology 1988;95:1335-9. Hikichi T, Fujio N, Akiba J, Azuma Y, Takahashi M, Yoshida A, et al. 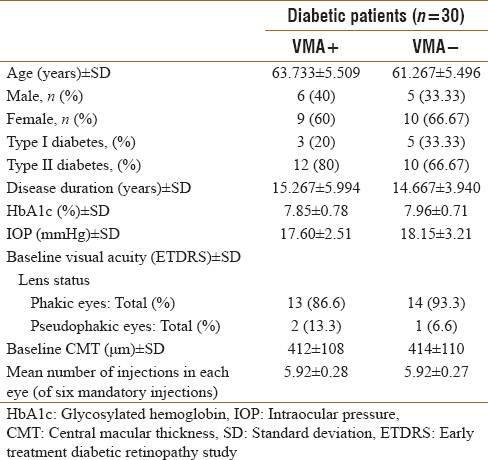 Association between the short-term natural history of diabetic macular edema and the vitreomacular relationship in type II diabetes mellitus. Ophthalmology 1997;104:473-8. Stefánsson E. Ocular oxygenation and the treatment of diabetic retinopathy. Surv Ophthalmol 2006;51:364-80. Stolba U, Binder S, Gruber D, Krebs I, Aggermann T, Neumaier B, et al. Vitrectomy for persistent diffuse diabetic macular edema. Am J Ophthalmol 2005;140:295-301. Veloso CE, Kanadani TM, Pereira FB, Nehemy MB. 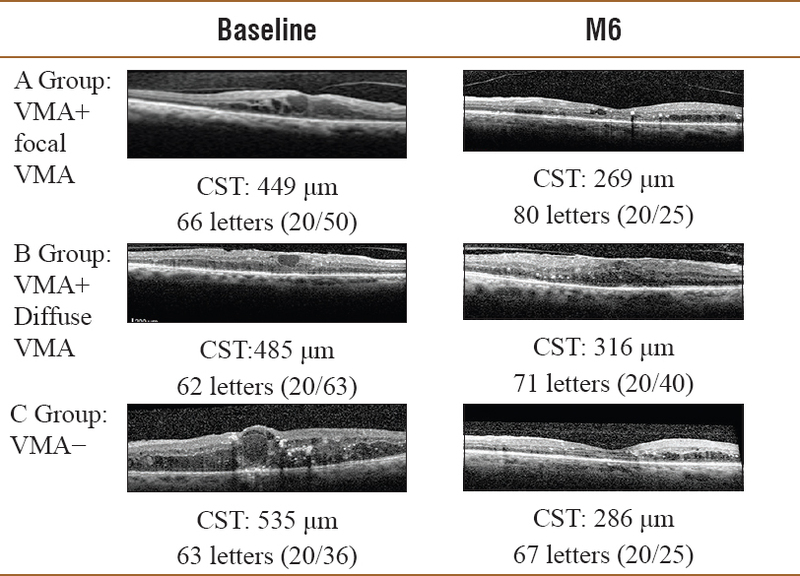 Vitreomacular interface after anti-vascular endothelial growth factor injections in neovascular age-related macular degeneration. Ophthalmology 2015;122:1569-72. Terao R, Yuda K, Kure K, Inoue T, Ohtsu H, Yanagi Y, et al. Effect of vitreomacular adhesion on antivascular endothelial growth factor therapy for macular edema secondary to branch retinal vein occlusion. Jpn J Ophthalmol 2014;58:139-45. Sadiq MA, Soliman MK, Sarwar S, Agarwal A, Hanout M, Demirel S, et al. Effect of vitreomacular adhesion on treatment outcomes in the ranibizumab for edema of the macula in diabetes (READ-3) study. Ophthalmology 2016;123:324-9.